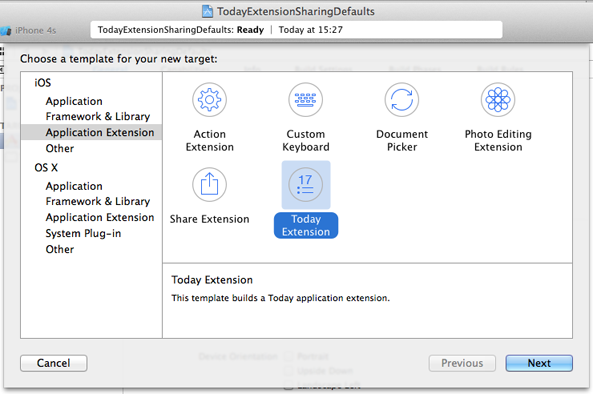 App extensions were introduced a couple of weeks ago during WWDC 2014 Keynote as a way to extend the reach of your app to some parts of iOS (8), for example by creating a widget that will show up in Notification Center, or a custom sharing action. It’s no doubt a huge opportunity for iOS/Mac developers, so if you have an idea for a widget/extension, I suggest you start working on it as soon as you can. If you are a registered iOS/Mac developer, definitely watch the WWDC Sessions Creating Extensions for iOS and OS X, Part 1 and 2 here. You will have a pretty good idea of what extensions are, how do they work and what you can do with them. The first part briefly explains how you can share data between your extension and containing app using NSUserDefaults, but neglects to point out some ‘pitfalls’ that you need to avoid in order to get it working. That’s where this tutorial comes in. Warning: as of writing this (end of June’14), the Xcode 6 beta 2 (that you need to use to build your extension) has some bugs that might cause you some annoyance, but you can generally track down and then avoid the certain actions/scenarios that make problems. 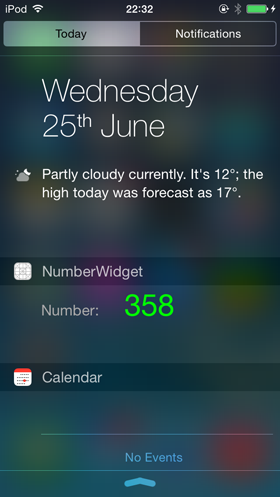 We are going to build a simple Today extension (that’s the name for iOS 8 widgets in Notification Center) that shows a number that can be set from the containing app (and changes made in the app will be reflected in the widget in real time). We’ll use shared NSUserDefaults to accomplish this. You can find the whole sample project on GitHub here. You’ll need Xcode 6 (beta 2 as of writing this, but any newer will do), and ideally a real iOS device running iOS 8 (beta 2 or higher). To obtain these beta releases, you need to be a registered iOS or Mac developer. Now I will guide you through the whole process of creating new project and doing everything necessary to get our extension to work. In Xcode 6, select File > New > Project. 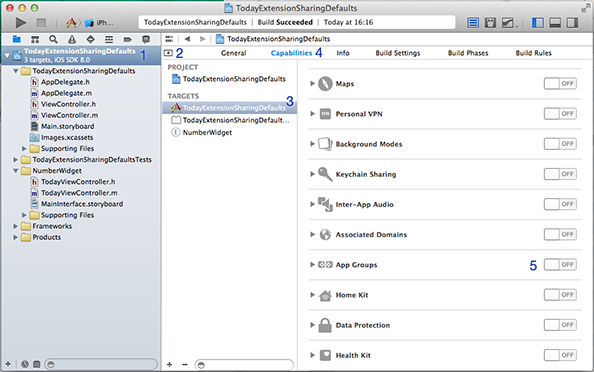 Select the Single view application template, and call it TodayExtensionSharingDefaults. You can use Swift if you feel like it, but we are going to stick with Objective-C for now. If you are looking for Swift version of this code, take a look at the comments section bellow. Conrad has some hints that will help you out. In Xcode, select File > New > Target…. Then in the left pane, select Application extension and under that choose Today Extension. Because our Today extension is going to show a number, give it the name NumberWidget. You will be asked if you want to activate the “NumberWidget” scheme. Click Cancel, since we are going to debug it using the normal Application scheme. In Project navigator under TodayExtensionSharingDefaults group, click on Main.storyboard. Add a text field and a button. – position it below the text field. Next, switch to the Assistant Editor and create outlet connection by control dragging from the text field to the interface. Call the outlet “textField”. Repeat the same for the button, but this time drag inside the implementation, and call the action “setButtonPressed”. – select the File inspector and uncheck ‘Use Auto Layout’ (for simplicity of this tutorial, we won’t use it). – add new label, change its text to 111 and its color to green. Position it next to the ‘Number:’ label. Now, you can run the project to test out the extension. When the app is launched (either on your device or in simulator), simply drag from top to show the notification center. At the bottom, tap edit and your NumberWidget should be listed in the ‘Do not include’ section. If it’s not, rebuild and then it should be there for sure. You can tap the green plus button next to it to add it and then Done to go back to the Today view. But wait, the extension view has zero height now! Don’t worry, that’s because we removed auto layout and haven’t set the preferredContentSize yet. We’ll do that in a minute. You need to do this to be able to share NSUserDefaults between your extension and the containing app. The process is very straightforward so lets jump right in. Now, turn on the App Groups switch. Select your Development Team to use for provisioning and click Choose. This will add the “App Groups” entitlement to your App ID. Depending on whether you did this before or not, there might be some other groups listed in the App Groups. Either way, click + to add new App Group and call it group.TodayExtensionSharingDefaults. Then, click OK.
Update 12 August ’14 As Malcolm Hall found out and shared in comments, the App Group name has to be unique since beta 5. So use group.yourcompany.TodayExtensionSharingDefaults instead in the rest of this tutorial. Xcode will now add “App Groups containers” entitlement to your App ID. If everything went as it should, the new App group should be there and it should be checked (as in the following screenshot). Now you need to repeat these steps for the Extension target, only this time you’ll use the already created App Group instead of creating new one. Select NumberWidget from the Targets list, turn on App Groups, select the same development team as in previous step and click Choose, and then select the group.yourcompany.TodayExtensionSharingDefaults. Great, now we are just one step from finish! Lets get to the code. [sharedDefaults synchronize];   // (!!) This is crucial. Here, we just alloc/init new NSUserDefaults with our App Group, and store the number entered inside the textField under MyNumberKey. Normally, you would want to define these strings as constants somewhere, but for simplicity of this tutorial we’ll leave this way. The synchronize call is crucial because we need the default to be written to disk immediately, since we will be reading it in the extension in a moment. Replace -initWithNibName with the following initializer. ↳ Here, we are adding an observer to the NSUserDefaultsDidChangeNotification. The NSNotificationCenter will now call our selector whenever a user default is changed. ↳ The first one signals to the Notification Center our desired size for the widget, and the second one updates the numberLabel based on the current value of @“MyNumberKey” default. 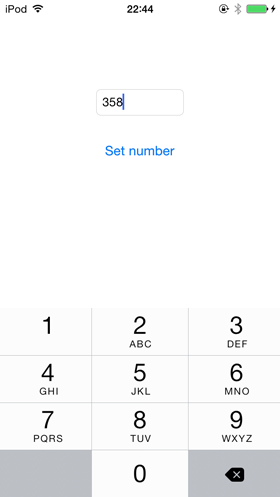 ↳ Here, we simply update the numberLabel’s text whenever defaults are changed. Note that the change notification will be posted whenever any default is changed, so if you’ll have more defaults, you might need to figure out a smarter way how/when update the values. Now you can Build and Run and you should be able to set any number inside the app and then see the change reflected in your widget immediately after opening the Notification Center. You should now have general idea how to build a very basic Today extensions and even how to share data between extension and the containing app. As I mentioned in the intro, you can find the sample app we built here on Github. I know that this tutorial is a very rough draft and there is a lot that could be improved, but due to my other projects and deadlines, I couldn’t dedicate this more time to make it more polished. I hope it will be/was helpful to you anyway ;). If you run into any other bugs or find something in this tutorial confusing, feel free to use the comments section below; I’ll try to help you out. – if the widget is not reflecting new changes, you need to: delete the app from your device; reboot it; perform Clean in Xcode, and then Build and Run again. You might need to build twice in case the Today extension is not there after first Build and Run. How extension will be notify, that some changes happen in containing app ? Because the observer added method is not get invoked. reason may be, When changes happen the extension controller not exist, when you open the extension, it will call init with coder and it will add observer. the extension is notified by NSNotificationCenter (we are adding the observer of NSUserDefaultsDidChange for this exact purpose). Obviously when the extension is not running, it can’t be notified, but it’s not an issue because as soon as it is “launched” when the notification center is opened, it will get the current value of the default (because we are calling -updateNumberLabelText in the -viewDidLoad method). Is this comment helpful? Great tutorial, but is there any chance that you could translate the extension code into Swift? I have never programmed in Objective C so translating can be a bit of a struggle for me. I managed to write the application code in Swift, but I can’t figure out the extension part. thanks! I am glad you like it. Unfortunately, I haven’t had the chance to start learning Swift yet, so I probably won’t be able to help you. But I’ll try! What lines exactly are struggling with in the extension code? Past them into your answer, and I’ll look around how they can be translated to Swift. Simple and Great tutorial!! Can you tell me how to open the main app, when user will tap on today extension!! I am glad you like it! Opening the app – that’s a good question! I know it’s not possible with the plain old [UIApplication openURL;], but I remember there was a similar method mentioned in the App extension programming guide. Take a look there and you should find it ;). Kevin, you are welcome. I have honestly no idea, I haven’t installed beta 4 yet, and I probably won’t have much time this week to do it, but as soon as I try it out I’ll let you know. And if you figured it out before that, please post your solution here for other readers to know. Thanks. Has there been any news on this? I am getting the same error which is preventing me from reading the NSUserDefaults within the extension. No, unfortunately, there hasn’t been. I am still stuck with some client work and I need to finish it first before I get to this. Hi, good work. You can actually shreotn it though. You don’t need to check whether a preference is already in the user defaults because the values you register are stored in the registration domain and returned only if the preference has not been set/changed. In other words, they are the defaults and any changes made in preferences will override then when you request a value. This is not obvious from the Apple doco, but this sentence from Accessing Preference Values, Registering Your App’s Default Preferences tells it all with regard to registerDefaults This method places your custom default values in the NSRegistrationDomain domain, which causes them to be returned when a preference is not explicitly set. And then add this in the TodayViewController.swift in the widgetPerformUpdateWithCompletionHandler function. I’m super new to iOS native dev so there might be a better way to do it. I had to clean my project each time for the extension to work properly. Once i changed the number it would change in the notification panel. Really cool stuff. Thanks for the tutorial as well! What happened if you don’t clean the project? 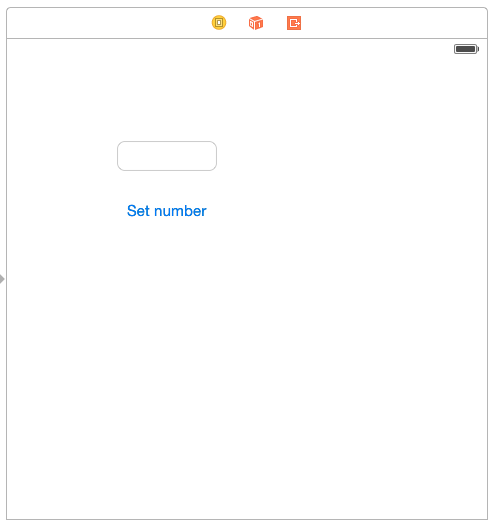 Can you show the code in TodayViewController.swift? Hey Conrad, I am glad you like it! Also, it’s great that you figured out how to do it in Swift, I will update the tutorial to direct people looking for Swift version to your comment. Would you mind posting your ViewController.swift and TodayViewController.swift? I am having trouble converting this tutorial to swift (I’m a total Xcode beginner). Great tutorial! I have redid the tutorial in Swift – get the widget up but unfortunately get nil for the default text. The main issue is that after every builds I will got this error: “A signed resource has been added, modified, or deleted”, and refuse to build. The only way I can solve this is to remove and redo a new group entitlement! Once I can get this solved, I will look into why I get nil for the default text in widget. I solve my own problem. The error will go away for a clean build, and the nil issue is I forgot to do the app groups for both targets. Hi Lim, thanks for the praise! Also, thanks for posting solution for your problem, hopefully other people who might have the same issue will find it helpful. can please share Swift version of this tutorial ? Hii, I am using your sample code, but today extension value is not changed in this code after entering in textfield ? why ? Hi, have you followed the tutorial or just got the sample code from GitHub? If it’s the latter, you need to set up the App groups for *both* your app and the extension. See step 5 of this tutorial. Hi Lukas, I think, you forgot to mention that to be able to Add Groups in the app (not in extension) one has to enable it (Add Groups ability) in provisioning file. thanks for your comment, but I haven’t forgotten that. Xcode provisioning profile manager does that automatically, when you turn on the App Group. But it’s true that if you already have a profile for the main app, you’d probably need to add this capability manually. So thanks for pointing that out :). for the purpose of sending update notifications from app to widget. That is exactly what i tried as well, but I couldn’t get it to work and unfortunately and it seems like yours isn’t working either. The number in your widget is only updated when the Notification Center opens, but not when the app synchronizes the NSUserDefaults in the background while Notification Center is open already. you are from Runtastic, huh? That’s direct competition for my app Routie, so I guess you won’t get any help from me ;D. No, I am just kidding ;). I honestly haven’t tried it with the timer, but what I would suggest you try: in the userDefaultsDidChange: method, add a dispatch_async call and then read the value from the default a second later. It might be the case that the default is not fully written to the disk when the notification is posted. I will get much more into it in the following weeks when I’ll start implementing this in Routie. PS: If you do figure it out, please, post about it here. I’d really appreciate it! What you suggested is exactly what i had done, hence the comment. I’ll continue to puzzle over it and will definitely share the results, if i get to the bottom of this. 😀 Ah, okay. I thought you are working on a widget for the main Runtastic iOS app. But, you work there as an iOS developer? On the app? If yes, it’s quite cool :). Regarding the timer: no, I suggested adding the delay into the widget, inside the notification observer. Because the question is whether the didChangeNotification doesn’t get called at all, or if it does get called, but at the time it is called the new value is not in the defaults yet. If it was the latter, reading the default after a little while would solve the issue. Please let me know if this makes sense, it’s kind of hard for me to describe it clearly in English. Did any of you guys manage to get this to work? It looks like NSNoticficationcenter does not work with app extensions. Please do post if you have more information on the subject. I’ve had a little time so I tried it, and really, it looks like the NSUserDefaultsDidChange observer method is never called. I’ll probably use timer that will poll the defaults every X seconds, and will do it in a smart way so it’s not too ineffective. When I changed it to setObject:forKey / objectForKey:, it suddenly worked! -> i will let you know once i crack the problem. NSUserDefaultsDidChangeNotification does NOT fire in the app or widget when something is changed in the other. I have been wrong about it. But if that is applicable for iOS, i don’t know & haven’t tried. I’m giving up on the matter, hoping the Notification will be supported in future releases. Everything works fine for me but I just get a 0 in the green label. Ive cleaned and deleted and reinstalled. Im on the simulator, not on the device. I just saw the updates to troubleshooting. Im trying to get it on a device that hasn’t been set up for development, so im trying to use a distribution profile for test flight. I can’t get this working because i get an error saying i didn’t provide entitlement for apple security groups or something. I click on Fix Issue but it always comes back the same. So I can’t get the profile to use in TF. it might be the case that the App Groups are causing this problem. As Malcolm noted in his comment, since beta 5, the App Groups need to be unique. So you need to insert your company name (or sth.) in there to make it unique. Let me know if this helps. When I tried to add the App Group capability I got an error that the application group with identifier ‘group.TodayExtensionSharingDefaults’ is not available. And then when I tried to add it manually in the dev center I got the error: An Application Group with Identifier ‘group.TodayExtensionSharingDefaults’ is not available. Please enter a different string. Any idea why I can’t use that string? Looks like the group container now has to be unique. I used group.com.mycompany.TodayExtensionSharingDefaults replacing mycompany with my domain name. And then that needs to be used in the code anywhere the defaults are accessed. thanks a lot for sharing that with us! I’ve just updated the post and gave you credit for discovering this :). I also recently got back to developing Routie update for iOS 8, and when I saw there was trouble with the App Groups, I immediately knew how to fix it. So thank you, I am sure readers coming here appreciate it as well. Hi. Thanx for the sharing. I have an additional question. I found that I can add UIScrollView in the view of widget, but scrolling was not possible. Does anybody know how to enable scrolling in the view of widget? Hi Roy, you are welcome. Adding scroll view with vertical scrolling is probably not a good idea, because it will interfere with scrolling of the notification center itself. I think that Apple even advices against it in the extension programming guide. I suggest you try to think of a different design of your extension that doesn’t involve vertical scrolling ;). Yes, I had read that, too. But I want to know if it’s impossible or it’s just recommended not to do. But, the user won’t be able to scroll them. And so also UISwipeGestureRecognizer won’t work. In the other hand, you can add button for the user like button with arrows right and left in order to scroll your UIScrollView. I have one question. Does that code work on devices. I am asking because I made something similar and it works only in simulator. And I don’t know what I did wrong. Using ios 8 beta 5 and xcode 6.0 beta iphone 5.
yes, it works on devices too. Sometimes you just need to remove the app, restart the device, and then install again to get it working. I have the same problem.! But what if I used [NSUserDefaults standardDefaults] in my existing app? Any smart way to transit the existing settings to the new userDefaults? And then you would import this category everywhere you need the -standardDefaults to be overriden. Or, you could define new category method called -sharedDefaults with the same code for more clarity, and use it everywhere instead of the -standardDefaults. Need to load some purchased items. Have to handle with care. Thnx for nice Tutorial.But i want to know one more thing if possible Let me tell something how actually Action Extension/Share Extension Will use.I have watched WWDC2014 but got no more idea,but with your tutorial i have learned very much.So please if possible then please please help me. I understand that it might be daunting at first. Make sure you are comfortable with view controllers in general, and then move onto the extensions. I don’t know your background, but it’s always a good idea to have solid understanding of the basics before moving further. In programming, there is no ‘skipping’. Now regarding the tutorial: I am not planning to write about it here, but maybe an article will be on Tuts+. In that case, I’ll let you know. You are welcome! I am glad to hear that it helped you :). Great tutorial. I’m having trouble with the App Group entitlements that I’m hoping you can help with. After creating my unique App Group, and making sure that it has App Group enabled in the Apple Developer center with its provisioning profile, I’m still getting an error which prompts me to Add the “App Groups” and “App Groups containters” entitlements to my App ID. I’ve tried to fix this by creating new App IDs and a new provisioning profile, but nothing has helped. Would love your input! I’m using XCode 6.1. I’ve had similar problem, and what helped me was to let the App Extension’s target’s provisioning profiles be managed by Xcode. In build settings inside Code Signing section, try setting ‘iOS Developer’ for the Code Signing identity, and ‘Automatic’ for Provisioning Profile. The main target could theoretically be managed by Xcode as well, though I couldn’t do that because I have the App ID in use on the App Store and I can’t change it. Also, make sure that the your widget target’s bundle identifier starts with your main target’s bundle identifier. Otherwise it doesn’t work. Thank you soooo much for this tutorial Lukas! Helped me a lot! Let’s say that you – instead of typing – fetch the number from a remote source. To display it in your ‘main’ app and in the widget, you can make a GET request (with AFNetworking or whatever you prefer) in viewDidLoad and then proceed pretty much the same way you’ve done. What is unclear to me is where we put the fetch code if we want it to be called every time the user pulls down the notification center. For example: if we display the score in a hockey game, we want the number(s) displayed in our widget to be up to date without having to enter the ‘main’ app. you are welcome! I am glad it helped you. Regarding your question: I suggest you start the update process in -viewWillAppear. It’s called every time user (A) opens Notification Center and your widget is visible, or (B) user scrolls to your widget (in case it was outside of the visible space, if you know what I mean). That’s what I am doing in my app, Routie, and it works good. Is there any way to use the Today Extension with iCloud and Core Data? I have not been able to get it working. Thanks for the tutorial. This is the best explanation I could found on the internet. However, it doesn’t work on my case even when I tried the example code from GitHub. There is no problem about reading the data saved into the shared user defaults. When the main app has saved the value into the defaults, extension can read it when I run the code second time. However, NSUserDefaultsDidChangeNotification is not fired and the extension cannot recognize when there is a change on the main app. I am using Xcode 6.1 and also tried all methods in the comments section including signing the app. Addind NSUserDefaultsDidChangeNotification in initWithCoder is not needed and is also misleading, because it is not working. NSNotificationCenter is not working between iOS app and app extension, it is working only in same process. Reason why new number is updated is because evert time when you do drop down of notification viewDidLoad is called and inside in you call [self updateNumberLabelText];. So please remote all code from initWithCoder because it is not working. I just spend one day figure it out. Your tutorial is very good as demo how to share data, but this part with NSNotificationCenter is completely wrong. Thank you. It works perfectly. Best example on the internet about Today extension.I have an additional question .If possible let me tell how i can change the value of Label that used on today widget suppose I am using stopwatch In the background app. and I am displaying the value of stopwatch on the widget so how it change while the stopwatch running in background app.I want that timer value display on widget label. I have an idea about the NSUserDefaultsDidChangeNotification issue. 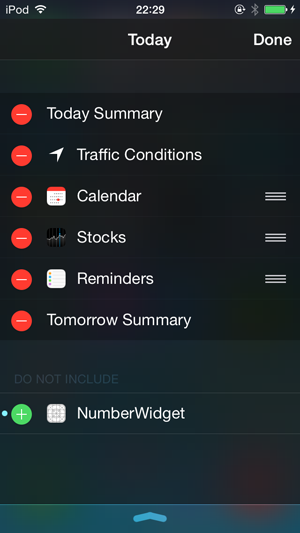 This notification center handles notifications within a single process. For communication between processes on the same machine, use a distributed notification center (see NSDistributedNotificationCenter). This distributed notification center handles notifications that can be sent between processes on a single machine. I’m afraid that NSDistributedNotificationCenter is not available on iOS. How can i change the widget to show text instead of numbers? sorry for such late reply; the blog was flooded with spam comments and I haven’t gone through them for a long time. In case you haven’t figured it out yet: it’s simple. You just need to store the text in NSUserDefaults (using methods stringForKey: and setObject:forKey:), and then set this retrieved string directly in the label.text. thats the simplest and upto the point tutorial. Thanks. I have a question, do you know how to make a call to the containing app from the click on a button in today widget. What should be the code in objective c? Now regarding your question: unfortunately, it’s not possible to call containing app like this. I’ve used a custom mechanism involving shared user defaults and pulling them every X seconds to facilitate this in my app Routie. So I would suggest doing something like that. But it really depends on your use case. By the way, what do you need the widget to do? Perhaps I could come up with some advice. I got the solution. Actually my question was like I have a button on the today widget and on the click of that button, the container app should open. I used URL scheme to open the container app. Can u help me out with the code how to add the address book iOS SDK selected Contact when clicked as a shortcut to our Widget.? Gracias 😀 estoy integrando UrbanAirship pero su documentación es mala, really is so bad, tu tutorial me ayudo muchisimo a entender una parte en la que me equivocaba. Lukas, you saved my day! Thanks for this great tutorial! Hi Bikram, I am glad you enjoyed the tutorial. You can set the value by calling the -setString: on the shared defaults. For completely live updates, you can use something like MMWormhole. Hope that helps. hi lukas, i am trying to start main (host app) from share extension. will you help me with that..
– the “yourapp” part has to be a url scheme that is defined inside your app. Hope that helps. i am doing something wrong ..
and i have few questions…. how will share extension understand urlscheme of host app? and how can i pass arguments from share extension to app? Thanks and sorry to bother you. sorry I forgot to get back to you. I don’t really know Xamarin so I can’t help you there. The url scheme of the main app obviously has to be defined in the plist file of the main app. Then, it will (should) work. url scheme do work fine..
Can we share the data from the Main application to widget without provision profile . As group.yourcompany.TodayExtensionSharingDefaults requires the development account to update the capabilities . So currently i am creating the demo app With widget to share the information on it . Lukas, can you provide the same for swift ? not Obj-C..